BMW M3 E46 Powered by Dodge Viper 8.0L V10 ENGINE! - Muscle Cars Zone! We have seen a lot of engine swaps, however this one may be the most impressive one. This time we will see a BMW M3 E46 with a Dodge Viper 8.0L V10 engine under the hood. These guys has decided to drop this american monster engine into the German BMW in order to make their car unique and of course to gain more torque on the wheels. However, we were pretty impressed from the position of the new engine. These guys actually did a pretty good job when they were integrating this monster in a place of 6 cylinder inline BMW engine. This was all made by Sulava Racing Team from Georgia and they explained the bonnet should be cut out before they installed the new engine, but at the end of the day that’s the small price to pay. 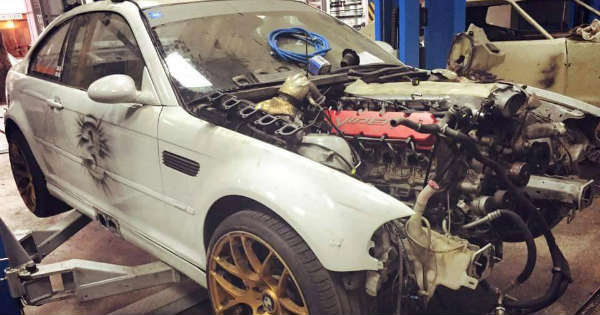 Unfortunately, we have not more info about this unique BMW M3 E46 and we don’t know if the car is running properly after the engine swap with a 8.0 liter V10 Dodge engine with 510 hp & 535 lb-ft of torque. Check out the video below, see how this monster looks like and please share your thoughts with us. Also, please share this post with your friends on Facebook and other social media.